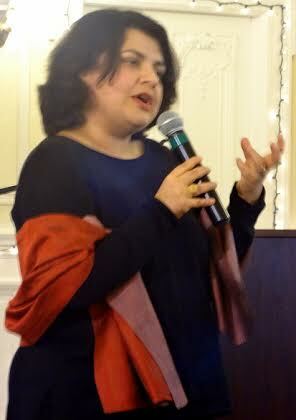 Harvard scholar Sharmila Sen speaking at the Indian Embassy in Washington, DC. American Bazaar file photo by Deepak Chitnis. Sen’s engaging personal memoir won the award in the Adult Non-Fiction category. Indian American author Sharmila Sen has won a 2019 “Asian/Pacific American Award for Literature” for her book Not Quite Not White: Losing and Finding Race in America. The awards, instituted by the Asian/Pacific American Librarians Association (APALA), are aimed at promoting Asian/Pacific American culture and heritage. They are given in five categories. The awards were announced on January 28. The winners will receive the awards at the annual APALA Literature Award Ceremony during the organization’s Annual Conference and Exhibition in Washington, D.C., later this year. Not Quite Not White, published last year by Penguin Books, is an engaging and personal memoir. It is also an important study on race in America, seen through the eyes of an Indian immigrant. Originally from Calcutta, India, Sen came to the United States when she was 12. She went to Harvard and Yale and also taught literature courses from Asia, Africa and the Caribbean. The writer, almost in a personal tone, examines the various societal systems ranging from caste, class, race and religion. The book is also an interesting smattering of various experiences that often share your life that has been formed in two parts of the world. Sen delves into her family and educational backgrounds and also vividly brings along mythology, politics, Bollywood and American entertainment. She pragmatically challenges the yearning for whiteness and that is what makes the book at once honest and relatable. The adult Non-Fiction honor title went to Litany or the Long Moment, by Mary-Kim Arnold. Other awardees of the year include Thirii Myo Kyaws’ The End of Peril, The End of Enmity, The End of Strife, A haven in Adult Fiction category. Though I Get Home by YZ Chin gets the honor title. Young Adult Literature winner is Darius the Great is Not Okay, written by Adib Khorram. Children’s Literature Award went to Front Desk by Kelly Yang and The Picture Book winner is Drawn Together, written by Minh Lê.